WHETSTONE, SIR WILLIAM, rear-admiral; commodore of the Newfoundland convoy, 1696; d. 1711. 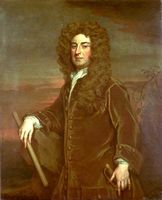 William Whetstone, believed to have been the son of John Whetstone, sailing master of Sir William Penn’s flagship in 1695, was commissioned captain of the Europa in 1689. 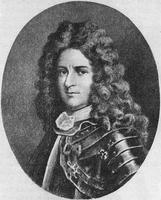 In 1696 Whetstone was appointed captain of the Dreadnought and commodore of the Newfoundland convoy. The convoy of 61 sail, bound for Newfoundland and New England, sailed from Plymouth 1 September, escorted by the Dreadnought and the Oxford. Apart from sighting French privateers who did not attack, the passage was uneventful though progress was slow. On 2 November, some 100 miles from Newfoundland, a French fly boat, La Courette, was captured. The owner of the vessel was said to be the governor of Placentia (Plaisance), Brouillan [Monbeton]. The master, Pierre Aubert, and 19 men were taken prisoner. It was learned that a week or two previously a powerful French force under Pierre Le Moyne d’Iberville had left Placentia and was moving up the coast toward St John’s. The land force was backed by a French squadron under Brouillan, which included J heavily armed ships, with up to 70 guns each easily capable of out-gunning both the Dreadnought with 64 guns and the Oxford with 54. The instructions given to Whetstone by th Admiralty before he sailed included the words “take care not imprudently to expose the ship under your command.” In view of the news of th destruction of the English fishing harbours, th superiority of the French forces, and the approaching winter, it was decided, after consultation with the masters of the Newfoundland-bound merchant ships, not to risk entering the harbours but to sail to the nearest ports in Spain. The following spring, 1697, an expedition, under Sir John Gibsone and Sir John Norris*, was sent out to recover the captured English settlements. On the accession of Queen Anne, Whetstone was sent with a small squadron to reinforce Vice Admiral Benbow in the West Indies. He arrived 8 May 1702. Later in the summer, in an engagement with Ducasse, Benbow was seriously injured and deputed Whetstone, with the local rank o rear-admiral, to sit as president of the court martial which tried Captains Kirkby and Wad for cowardice. After Benbow’s death in November 1702 Whetstone assumed command of the fleet and ii the summer of the following year joined th squadron commanded by Vice-Admiral Graydon which was to attack the French at Placentia Whetstone was present at the council of war which decided not to risk the attack, but – perhaps because of his services in the West Indies – he escaped the criticism heaped on the unfortunate Graydon. On 22 Feb. 1704/5 Whetstone was knighted and spent the rest of the year on service in the Caribbean. In 1707, however, an unfortunate sequence of events led to Whetstone’s being supersede in his command, and, as in the case of Vice Admiral Graydon, he was not employed again Sir William Whetstone died apparently in th spring of 1711. Letters of administration, wherein he is described as “of Bristol,” were granted to his widow Maria. PRO, Adm. 2/21 (orders and instructions); 51/4170 pt.7 (captain’s log of H.M.S. Dreadnought); CSP Col., 1702, 1702–3, 1704–5, 1706–8. Charnock Biographia navalis, II. DNB. Michael Godfrey, “WHETSTONE, SIR WILLIAM,” in Dictionary of Canadian Biography, vol. 2, University of Toronto/Université Laval, 2003–, accessed April 25, 2019, http://www.biographi.ca/en/bio/whetstone_william_2E.html.